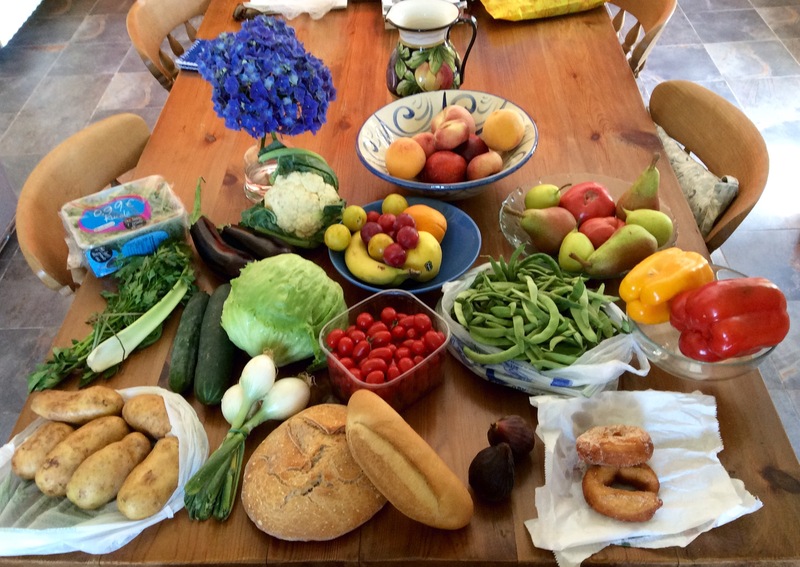 A brilliant haul from yesterdays farmers market in Lagonegro, Italy. Where does one begin…How about “Hello wonderful world”. I am from St. John’s, Newfoundland, Canada – as far east as you can go before stepping into the Atlantic. A proud mother of two girls (18 & 23), I write and cook, forever discovering new things about both and in the process I discover new things about myself. I take delight in books, farmers markets, children, fresh flowers, a really great pen on quality paper and a perfect cup of tea or coffee. I collect blank notebooks, stones, little seashells and tiny bits of driftwood. My partner and I love to travel and as unexpected as life is, I am now travelling the globe – house sitting, staying with friends, vacationing – however we like! How wonderful is that? Aye..brilliant is the name of my blog. Where did that come from? Well, I didn’t want the title to be so specific as to what ‘topics’ might me discussed here. I have no agenda. I just want a place to air my thoughts and musings, ideas and life happenings. ‘Brilliant’ is the new Irish/UK buzz word – maybe not that new, but new to me. In North America, everything is still ‘amazing’ and ‘awesome’, and in my opinion, both are so overused. But listening to and reading about people from the UK and Ireland, things are often said to be ‘brilliant’. By definition, ‘brilliant’ means ‘extremely intelligent or skilled’ or ‘full of light, shining, or bright colour’ and informally in the UK it means ‘very good’ (according to the Cambridge Dictionary online). Here, I would like my writings and thoughts to represent the best of what life has to offer,concepts that pique my curiosity, things that make me smile, ideas that move me to think further…you get it. Yes – this or that has caught my attention, has made me want to explore it further. And I’d like to share it with you. Benvenuto al mio blog – welcome to my blog! OMGosh, we are SO related. Just brilliant, darling cousin. I shall live my Mediterranean dreams vicariously through you … for now, just until it’s my turn. Much love. Be happy.